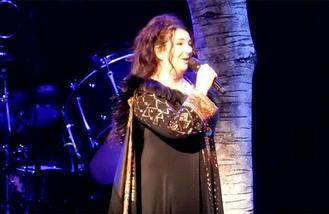 Kate Bush is releasing a new live album. The 58-year-old musician will comprise the record out of performances taken from her 22-show run at London's Hammersmith Apollo in 2014. The album, entitled 'Before The Dawn', will mark the star's first release since 2011's '50 Words for Snow'. The compilation is billed as a triple album, with each one marking different sections of the run of concerts she performed. 'Act One' consists of a seven song set of hits from throughout Kate's career including tracks such as 'Hounds of Love' and 'Running Up That Hill'. 'Act Two' features the songs from side two of the 1985 album 'Hounds of Love', in a sequence of songs collectively titled 'The Ninth Wave'. Tracks on this section of the album will include the spoken word piece 'The Astronomer's Call'. Finally, 'Act Three' is made up of the songs from side two of Kate's 2005 album 'Aerial', collectively known as 'A Sky of Honey'. As well as including the show's encore performance - which featured tracks 'Among Angels' and 'Cloudbusting' - 'Act Three' also treats fans to 'Tawny Moon', a brand new track sung by Kate's son Bertie McIntosh, which gets its first official release on the live album. It will also feature 'Never Be Mine', a track which Kate didn't actually perform at any of her Hammersmith Apollo dates. It is thought that the recording of this track came from her rehearsals leading up to the shows. It was originally featured on the 1989 album 'The Sensual World'. The 2014 shows marked Kate's first gigs since her one and only tour in 1979. 'Before The Dawn' will be released on November 25. Busted have dropped lead single 'On What You're On' from their new LP 'Night Driver'. Metallica have admitted they sometimes "hate" one another. Niall Horan won't release an album until "early summer" next year. Pop star Kesha has backed former Miss Universe Alicia Machado in her war of words with U.S. presidential hopeful Donald Trump. Pregnant Janet Jackson was absolutely radiant as she shopped for baby products in London on Tuesday (27Sep16). Pop star Ariana Grande would be open to crossing over into country music in honour of her grandfather. Another posthumous David Bowie album has been announced with greatest hits compilation, Legacy, set to come out on 11 November. Daft Punk are rumoured to be headlining Glastonbury Festival 2017. Rapper Tyga and Kylie Jenner have put on a racy display in Alexander Wang’s latest campaign.